The shark circled us slowly. The dark water of the night dive made the detail of the beast hard to see but there was no doubt of its size. It was a gray reef shark all right, a big one. I reached up for the 5 meter bar floating above me and looked down to Cesca. She had not yet seen the shark. I turned my torch on and its beam highlighted the gloom as well as the millions of floating particles all around us. It was like seeing through a snow storm. I swung it towards the sharks shape. I wanted to know what it was thinking, I knew that it could sense the energy flooding through our bodies and smell the blood in our veins but did wonder about the strange vessel above our heads. It must have seen those before and they always brought food, in fact I myself had seen the crew chumping fish into the water to attract these sea hunters. 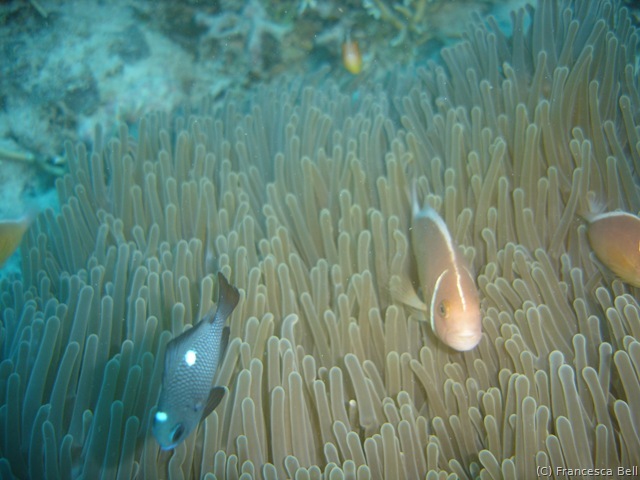 They are one of the main tourist attractions of diving the reef. An easy fact until one is actually underwater with one. The light was reflecting back towards me from the sharks eye. It was therefore looking directly at the torch. I pulled the torch away and onto my console floating by my left arm. Cesca joined me at the bar and she checked her console as well. My dive computer was clear, I had to do a 3 minute stop here, 5 meters bellow the boat, before ascending. Cesca held up 3 fingers. She had the same readings on her computer. That’s 3 minutes with this shark swimming around us. Its not that Grey sharks as especially dangerous to divers, but they have been known to take a bite out of a limbs waving around. I couldn’t wait any longer I wanted to get a good look at him. I panned the torch around until his eyes reflected the light again. Cesca watched and then looked at me. I put my right hand against my head like a fin. The sign for shark. She looked quickly at he beast and then gabbed my arm and pulled herself protectively closer. Cesca like myself is new to sharing the water with something that could easily eat us. We watched it circle and then suddenly with a flick of its tail it changed course. It was now coming directly towards us, its decision made; that light was worth investigating, there may be food there. I watched its speed and then turned off the light. If it was coming for us it would be on top of us in 5 seconds. I had not been big on the idea of night diving. 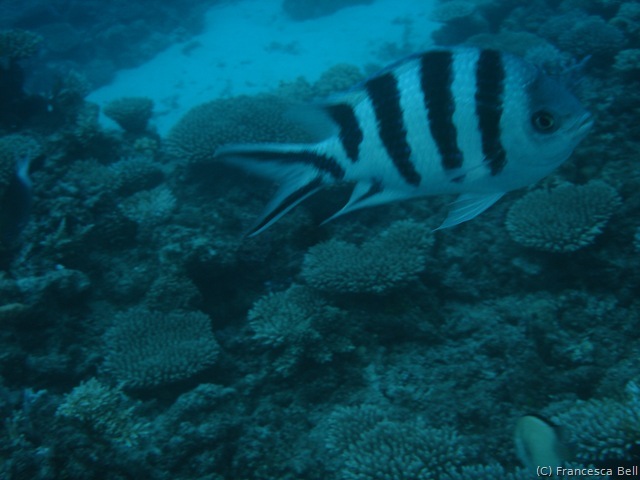 The previous night we had performed a guided night dive on the reef as part of our Advanced PADI course and that had been fine as all we had to do was follow our guide. 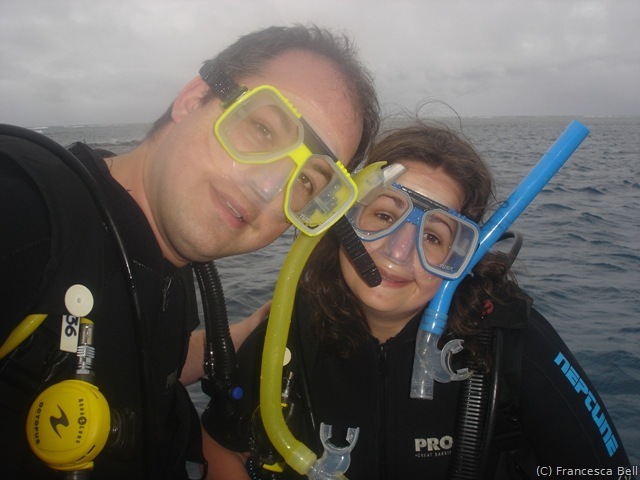 However, when on our own, well I knew how bad Cesca and I were at underwater navigation. If we could get lost in the day, then a night excursion to 14 meters, too deep to surface to see where the boat was without a stop, could get us into real trouble. Again, it is all about experience. 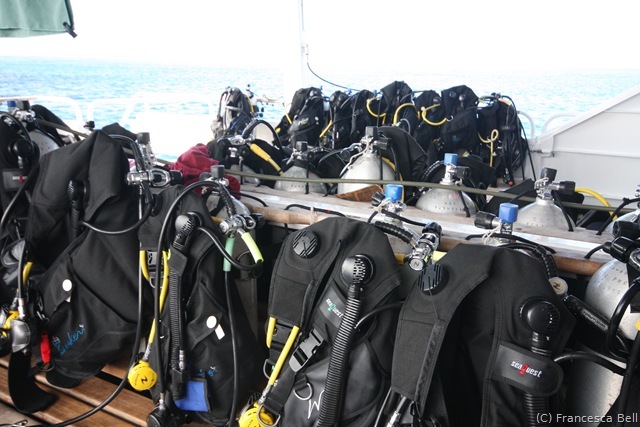 In fact that is the way the Advanced PADI course is designed; to give you that experience and enable you to become comfortable with different types of diving. 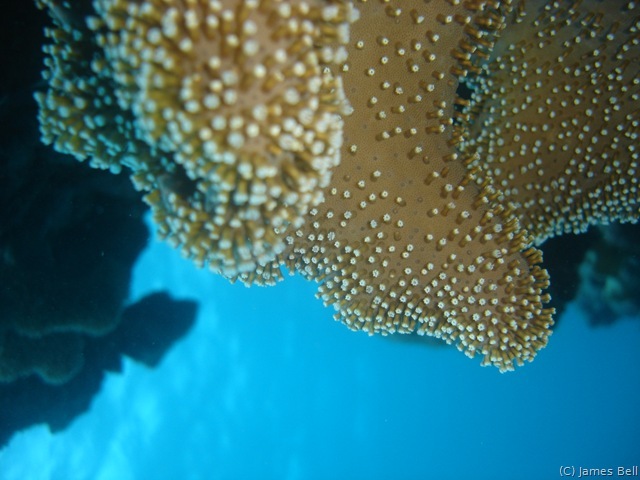 The course run by Cairns Pro-Dive is one of the most respected on the reef. 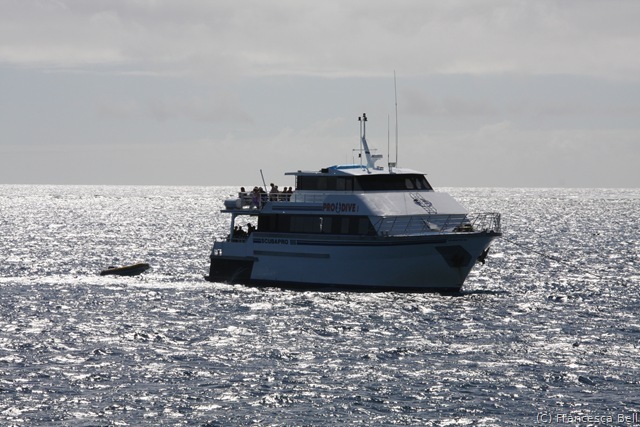 11 dives over 3 nights at sea in the specially built SCUBAPRO vessel. A private birth, all food included and a top instructor. It sounded too good to be true but the detail was in the price tag, which was high. There are tons of operators on the reef, but after a couple were left behind by one boat I knew that I wanted one of the best. I scrounged around the net and found a late booking deal through an agent. The Pro-Dive team have the quiet relaxed and slightly bored look of men who do this trip with a new group every single week but had bags of professionalism. They all sported good tans, easy smiles and branded shirts. The ride out of Cairns had been very rough and had taken few prisoners. Francesca and I had stocked up on sea sickness pills along with coffee in the morning so while we certainly didn’t enjoy the roughness of the sea, we didn’t feel the need to share our breakfast with it. 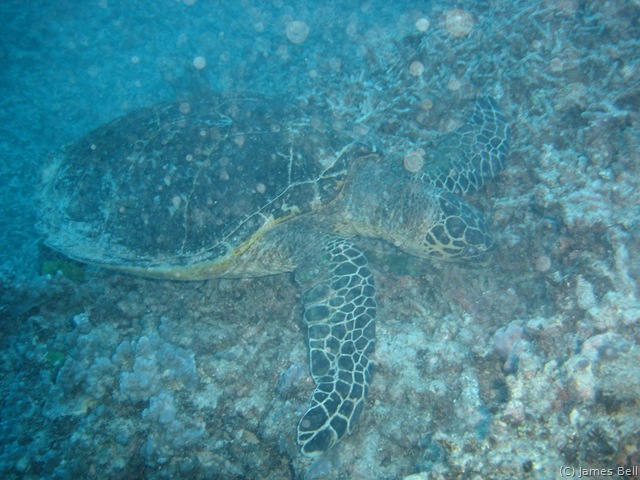 Once anchored on the reef the dives started straight away. 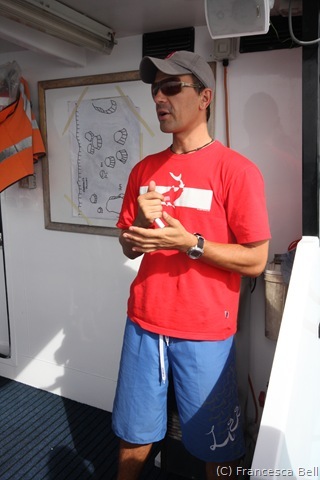 Firstly the dive master gave a briefing on the top deck that was designed to orientate us with the reef’s features and point out some things not to miss. He suggested an easy course around the site that would start at 10 meters and slowly rise, removing the need for a safety stop all together. He assured us that no one would get lost. This became a running joke over the next few days. Excited to be back in the water, Cesca and I made our way back down to the lower deck, the dive deck, to kit up. Eager and smiling we checked each others dive equipment as buddies are trained to do. Firstly we check the regulator is working and oxygen is flowing when breathing. you do this while watching the air gauge on the console as a tank that is not turned can have a few breaths sat in the pipe. If the O2 needle doesn’t drop as you breath the tank is fine. We then check the second backup regulator the same way. This is followed by checking the weight belt, mask and flippers are on and that the BCD inflates and deflates. Again the BCD is vital to safety and is how you stay afloat. A broken one will make you sink like a stone until you get your belt off. Finally we check that the tank is correctly attached and the air is all the way on minus a half a turn. Only then can one actually get in the water. If this sounds like hard work, then welcome to diving. 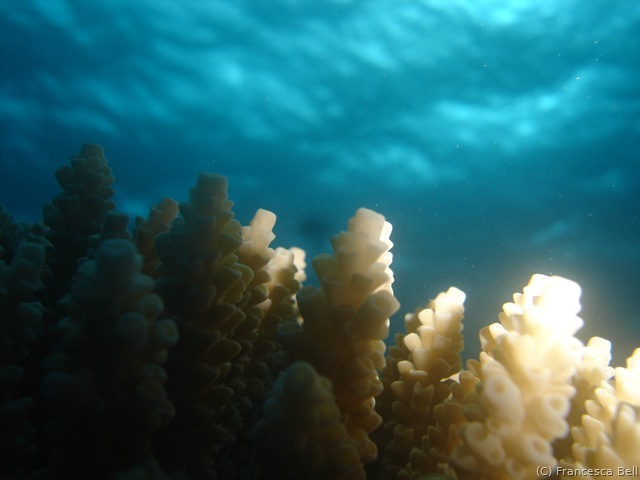 Diving can be one of the most relaxing experiences of your life. Can be. For the beginner or occasional diver it can be a adrenalin fuelled, heart pounding, thrill ride that is over far to quickly. The more experienced you are the more you can relax and therefore the slower you breath. Slow breathing is calming and relaxing and you go through your O2 much slower. You will also make less mistakes. Diving can be a harsh lesson in not screwing up and paying attention. Any sport where you need to pair up has dangers. Suffice to say a lot of people got lost on the first dive. The next dive was the start of the Advanced lessons. All those on our course sat around the same table and we all started to get to know each other. With the many nights at the hostel food courts, Cesca and I soon broke the ice and started chatting with the other students. The Advanced students looked a lot calmer than the table next to us full of first timers, fresh from the swimming pool lessons. 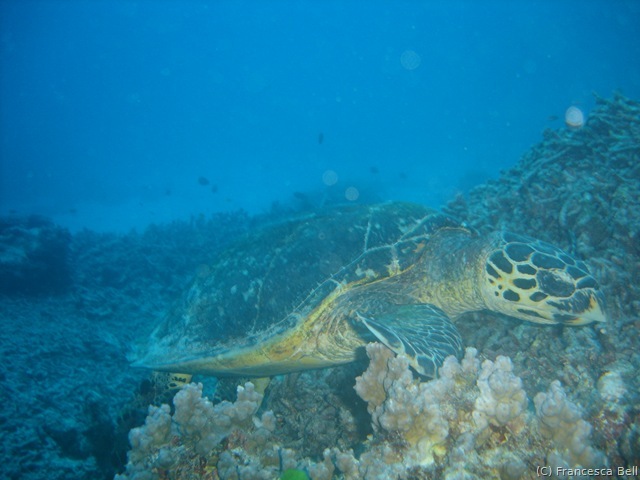 Advanced PADI involves a number of taster dives in various specialisations. 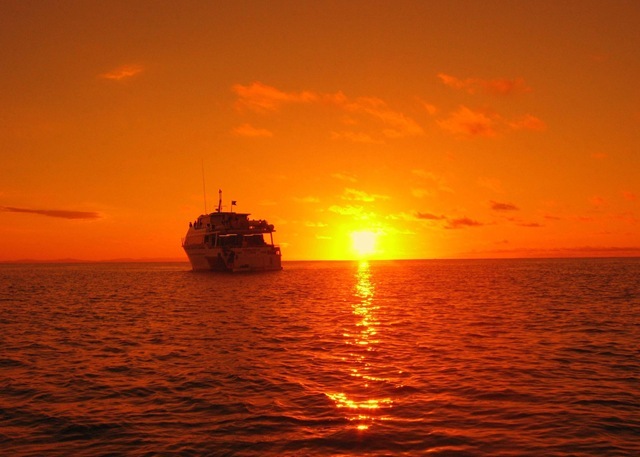 There are 3 core dives of deep dive, night dive and navigation. Then there are the 2 electives. They are many electives to choose from but almost everyone picks photography and naturalist. These two are the easiest and most fun. No one went for the search and rescue dive as this involved the instructor throwing a spoon off the boat and making you go and find it! The lessons went quickly and the dives soon started racking up. The navigation dive was excellent training and taught us how to count our kicks to estimate distance, how to use the compass to ensure direction an baring and how to find our way back using the reefs landmarks as a guide. The deep dive, down to 25 meters, was very spooky and slightly scary in its depth. Whilst down there the instructor asked us to count to 20 to demonstrate how nitrogen narcosis takes effect at that depth and it becomes hard to focus the mind. I counted as carefully as I could and then held up my hand. Once back on the boat we counted again and compared the time differences. 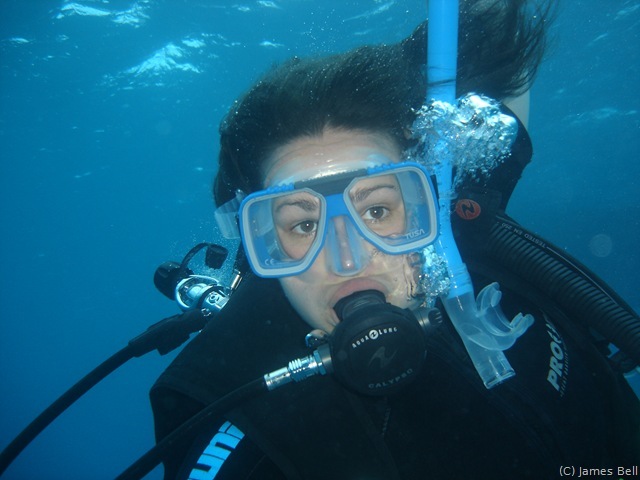 Cesca’s was 32 underwater and 22 on the boat. Strangely mine was 24 and 24, which goes to show that I can’t count at any depth! 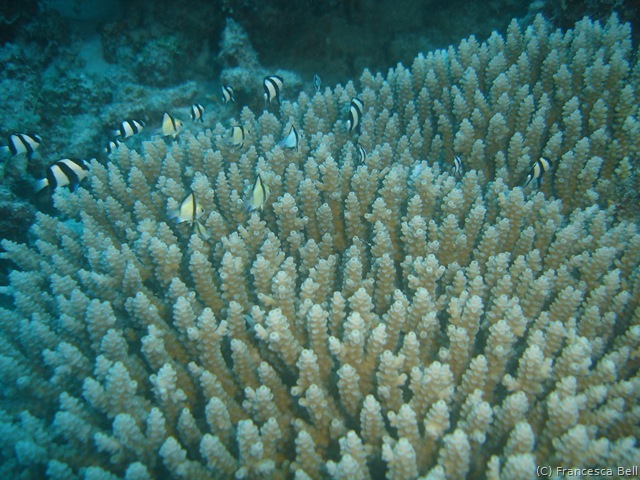 Plant and animal life on the Milne, Petaj and Flyne reef’s is amazing. 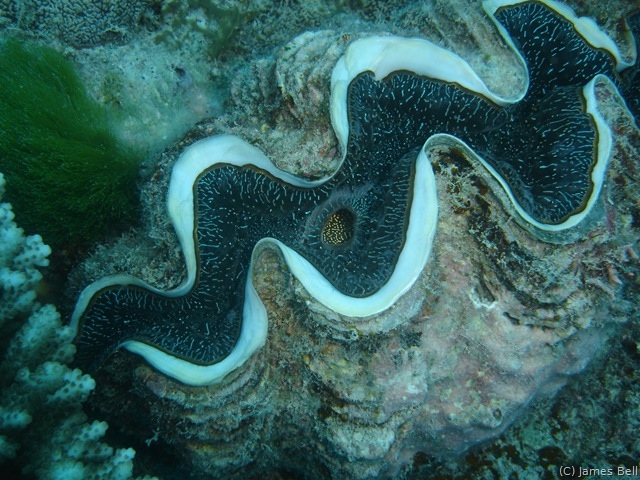 We saw some of the worlds most amazing coral gardens resplendent with all sorts of corals and living organisms. 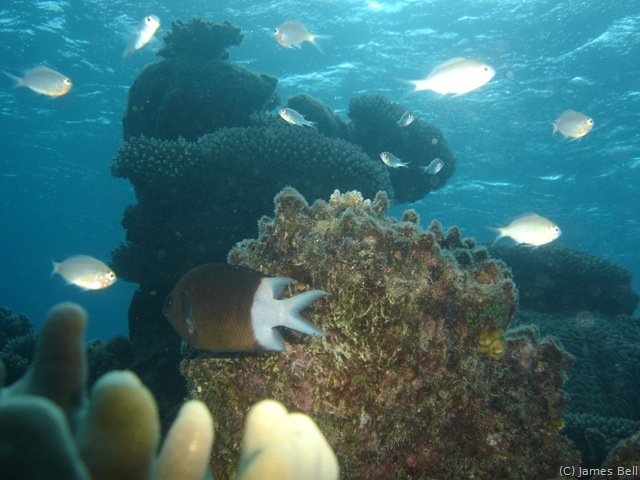 Cesca was very fond of the Christmas Tree worms that sprout from rocks and corals. Animal life was similarly amazing. 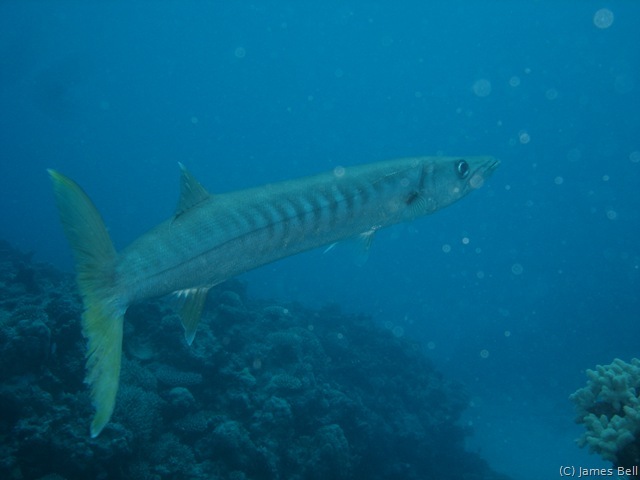 We swam inches from turtles, around endless multitudes of fish of all types and colours and past many fast moving Barracuda’s. 5… I turned the torch back on. The large Gray shark had resumed his orbit back out at 20 meters. We both breathed a huge sigh of relief. I glanced at my computer and saw that our 3 minutes was up and we gladly ascended out of the darkness and gloom to the boat. This night diving wasn’t so hard after all and as for sharks, well leave them alone and they will leave you it seems. The Advanced PADI Course had succeeded to make us more confident. 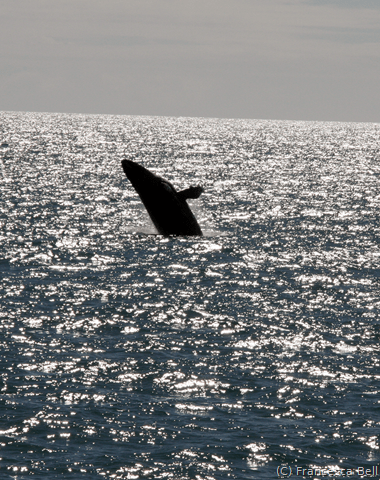 However, the most impressive thing I saw during the trip actually was seen outside the water. 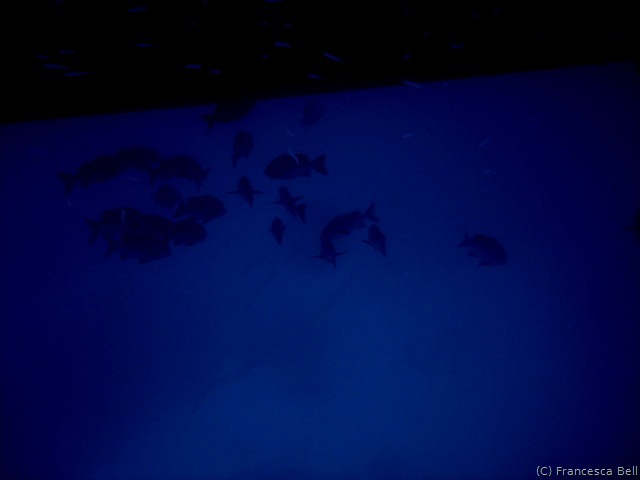 While heading to our birth on the top deck of the boat I came across another diver staring out into dark night. I wondered if he was feeling ok when he turned to me and said, “can you see that rainbow over there?” I looked in puzzlement and sure enough about a mile off the from the boat sat a rainbow. At night. It was very clear and we could make out all the colours even though they were darker than normal. I stood in wonder for 5 seconds not saying anything. But what caused it? I looked behind us and the moon was very bright and full and being winter very low to the horizon. It was just enough light to cast the rainbow against a light shower. I must tell Cesca I thought and went to find her. I told everyone I passed about the moonbow, but most didn’t believe me. I couldn’t find Cesca anywhere and when she finally emerged we ran back up to the top deck to find it was gone in cloud. 30 years I have inhabited this planet and I have never seen one of those before. I cant help but wonder if I will ever see one again. The next day the boat headed back into town and we started the drinking with the friends we had made on the course. On the way we passed a mother Whale playing with her child and everyone crammed onto the top deck to take photos. 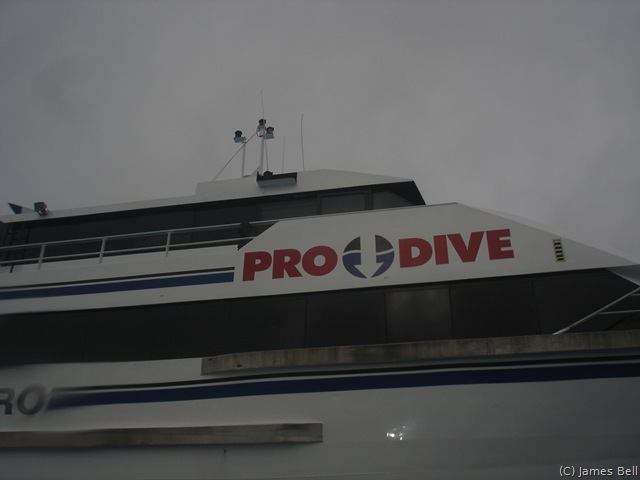 Once back on dry land we visited the Pro-Dive shop and paid the bill (OMG!) and then to our hostel. After putting the flames out on my wallet we showered and changed. After all the live-aboard courses there is the obligatory night on the town with the crew and other divers so we headed back out and had a piss up to remember.